As a new employee, I was pleasantly surprised to receive a thoughtful Thanksgiving card and grocery credit from the Shields family this past week. What had I done to deserve this helpful holiday gift? I did some digging, and discovered that this Shields family tradition dates back to Thanksgiving of 1986, the year that Tom and Mary Shields founded their MRI business. Back in 1986, Tom and Mary Shields, the founding owners of Shields Health Care, decided to buy each of their employees a bountiful bird for their Thanksgiving tables – the birds were hand-delivered to every employee. Tom Shields was renowned for encouraging employees to treat patients “like their own mother,” and this was an approach modeled in all their relationships. This heartwarming gift became a company tradition, and, the week before Thanksgiving, trucks would pull up to each Shields location with frozen turkeys for everyone on the team. 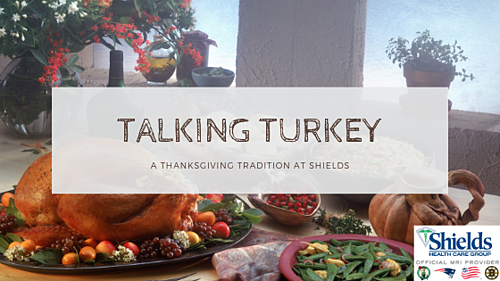 Many longtime Shields employees look back fondly at those turkey delivery years, remembering the convenience and kindness such a delivery represented for their families. As the company grew, with Shields adding new locations and dedicated employees across New England, so did the tradition. In recent years, with nearly 1000 employees stretched from Pittsfield to Harwich (and as far north as Lewiston, ME), the Shields family tradition has morphed into the distribution of gift cards, but the sentiment remains the same. Thanksgiving purists can still, of course, use the card to buy their annual turkey, but now vegetarians, vegans, and employees who don’t cook can also get in on the fun and mark the holiday in their own special way.